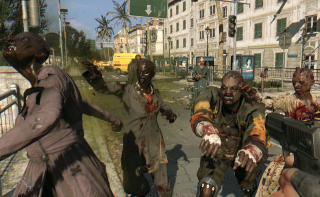 You can't have a game about ruthlessly slaughtering zombies with exotic weapons without a horde mode, and Techland is aware of this: The Bozak Horde is a new DLC pack coming to Dying Light on May 26, and that's what it is. Set in Harran Stadium, the mode was designed with cooperative play in mind, but you can go solo if you're brave. Those who complete the Bozak Horde will be rewarded with a new "ultimate stealth weapon" in the form of a compound hunting bow. Further challenges offer advanced arrows for the bow, including electric, incendiary and explosive. And while the mode was designed for cooperative play, there will be an unspecified competitive element too (probably leaderboards, but that's a guess). If slaying zombies isn't really your thing but you still own Dying Light for some reason, here's a clever mod set in space, and zombies free.